They say don’t judge a book by its cover. How about a play’s title? IRT, 140 W. Washington Street, Indianapolis, opened Stephen Dietz’s Becky’s New Car this week, and the title says it all. 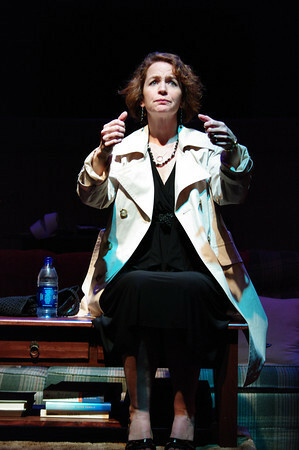 Middle-aged Becky Foster, played by Constance Macy, Iron Kisses, is tired of her humdr um life and wants some excitement. While working overtime at a posh auto dealership and fantasizing about her own dream car whisking her away from her sedate life, a wealthy widower stops by to buy nine cars for his employees. Walter Flood, portrayed by Nicholas Hormann, The Heavens are Hung in Black, is mourning the loss of his wife, who handled all of life’s little details for him. Becky is the go-to person for everyone. It’s a perfect match...except that Becky has a husband. Joe Foster, played by Robert Neal, is the blue collar worker content with his lot in life. Neal turns in a makes-it-look-easy performance as a sitcom-style husband, clueless as to how to make his wife happy. Hormann nails the role of Flood as a befuddled, born-into-wealth, lost soul matching comfortably with Beck y’s organized personality. Dietz, known for disregarding the invisible line between stage and audience, also ignores the unseen wall between the actor and the stage crew. This is the crux of the high-speed merriment and the genius of playwright Stephen Dietz. B r e a k i n g through the fourth wall numerous times, Macy’s performance is pure comedic delight as she interacts with the audience, asking for help on various issues and duties. She then instructs the crew on lighting, setting and wardrobe changes. All of this interaction is done on the pop-up storybook stage set while changing clothes onstage, selling cars, cleaning the living room and cheating on her husband. She is quite the expert multitasker. 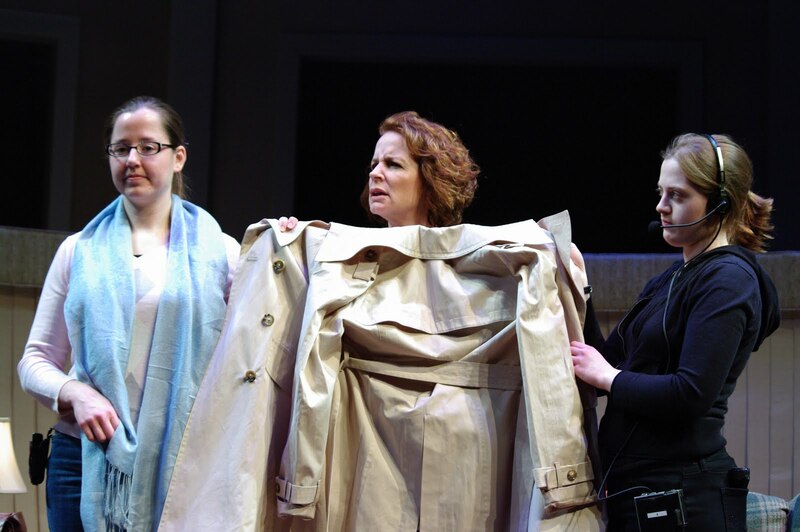 At first glance, this play is just another comedy. 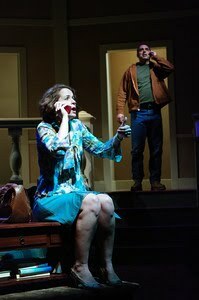 Upon next-day glance, the sitcom-esque play is more. It addresses dreams, desperation and death. It brings forth the repercussions of disregarding marital vows and the aftereffects of betrayal while keeping the audience laughing. It h as several story lines joining together at the end, most I have not mentioned for fear of revealing too many surprises. Bottom Line: Becky’s New Car is an interactive comedy which you needn’t bother going to see unless you are ready for an 80-mph, convertible-top-down, radio-blasting, sun-shining drive along Life Moves Fast Boulevard. If you have a performance you would like reviewed, email elizabeth@gottago.us. Me, I will be right here, cruising along that boulevard. I recently ate at an interesting eatery on the far east side of Indy. Arbor Café and Tea Room, 7173 W. U.S. 40, was started by a woman who refused to give up her dream. Sonja (Sandy) Tanner came to our country at the age of 9 from Germany, unable to speak English. She learned from television chef Julia Childs how to cook and how to speak our language. Personable and down-to-earth, the owner seated me in one of the parlors and started feeding me; I was more than okay with that. The Elvis-loving chef/owner is always willing to turn over her kitchen to Chef David Hornung in order to play a game of Skip-Bo with her customers. You’ve got to love a chef that laid back. Featuring a full traditional menu for breakfast, lunch and dinner, Arbor also specializes in an additional menu of German food available on special nights. Some items featured on the menu include Schweizer Schnitzel (pork tenderloin with Swiss cheese), and Rouladin (beef steak with wine glaze), Bratwurst and Knockwurst. The French Onion Soup with Parmesan and Swiss cheeses was full of onions and rich beef broth and is worth a return trip by itself. I also tasted the Chicken Salad sandwich, made fresh daily, delicious in taste and generous in portion. The non-fussy eatery has a décor which brings visions of visiting a favorite aunt in her home, complete with a parlor. Tea and fresh scones are available, complete with clotted cream and marmalade. Even Alice in Wonderland’s Mad Hatter should be satisfied with that tea party. Special Note: You can now catch me every Saturday morning as a featured guest critic on radio station WIBC 93.1 FM. I will discuss where you’ve Gotta Go and what to check out in Indy’s theater and entertainment scene on the Joe Ulery Show. If you have a restaurant or event you would like reviewed, send an e-mail to elizabeth@gottago.us. Me, I'll be right here, thinking about Schnitznel. Some things cannot be measured, cannot be explained, cannot be described. They can't be understood until you have experienced them. Such is the case with milestones in one's life. Whether it is birth, death, graduation, wedding, divorce or some other significant point in one's life, it is a threshold which must be crossed before fully absorbing all that the event entails. No one can give you the complete package, you have to earn it, bad or good. Such is the case with my recent trip to Charleston, South Carolina. Rose Jeanette Bodenreider arrived into this world at 1:48 pm on March 8, logging in at 8 pounds, one ounce, 20 and one half inches and boasting a head full of beautiful hair. This little bundle of joy will lead me into unfamiliar territory...the world of grandmother. Holding her in my arms, swaddled in a pink blanket, for the first time reaffirmed how valuable are family and life. No matter the distance, no matter the effort required, every ounce of energy put into the relationship comes back tenfold. Looking into Baby Rose's alert and angelic eyes, I knew that I wanted to be a part of her first word, step, tooth, all of the firsts that come along. Every one of her milestones will be a priority in my life as she has become a milestone in my life. Jobs, education, military appointment and a multitude of other reasons have flung families into separate directions as if leaves in the wind. This, too is the case for my family. My son Blake, serving in the nuclear power division of the United States Navy, is stationed in South Carolina. He and my daughter-in-law, Melissa, are the proud parents of this little one they have lovingly nicknamed Little Bunny. As I catch Mom, glowing with happiness, looking down into her first born's face as the early morning sun filters into the nursery; as I watch Dad dancing with his princess around the living room to Wicked's, "Dancing Through Life," I feel blessed to be included in the beginning of the next generation. To be part of the next chapter of the family history is more than special. As I continue through the autumn of my life I relax knowing my son and daughter-in-law, in the summer of their lives, have taken on well the responsibilities of raising their own family. Surely the best thing in life is the love of one's children and, now, grandchild; I hope to say grandchildren eventually. Until then little Rose, the flower of my heart, will show me how to be the best grandmother I can be. If you have a special event you would like reviewed, e-mail me at elizabeth@gottago.us. Me, I will be right here, looking for scrapbooks for the dozens of baby pictures I have already taken. Some problems are just not all that bad. 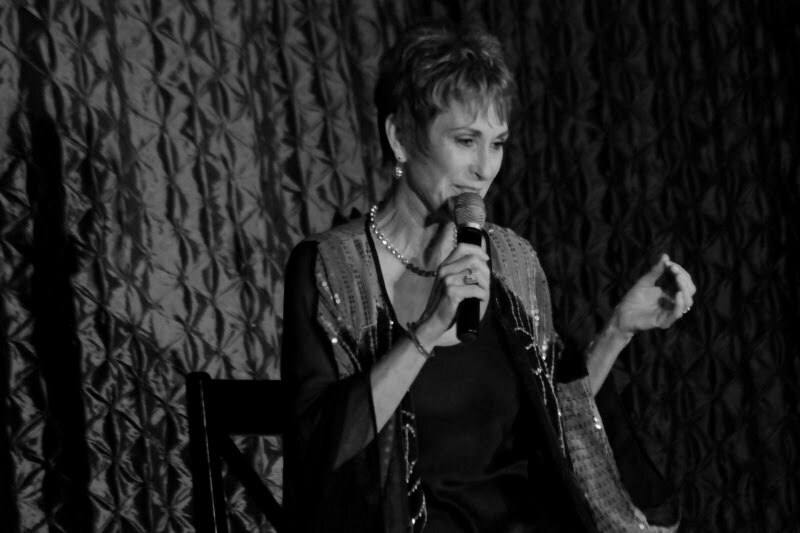 The Cabaret at the Columbia Club, recently moved to its new spot in the historic landmark, had such a situation. Director Shannon Forsell’s vision of introducing cabaret greats to Indy created sold-out shows creati ng the need for an even bigger venue. Like I said, some problems are just not all that bad. This move down the corridor led to the Crystal Terrace which literally overlooks the Circle’s War Memorial. The increased space of 25 tables indicates this will be the permanent home. 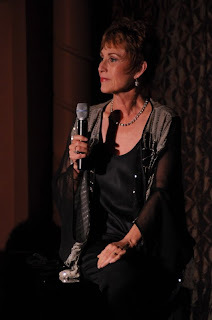 However, the sold-out performance of Amanda McBroom Friday evening indicates the need for even more seating. So, keep the packing boxes on hand, because Forsell has proven she has her finger on the pulse of Indy when she created and defined its cabaret scene. Headlining the opening night of the 2010-11 season, McBroom, singer, songwriter and actress, provided an evening of emotional awareness. 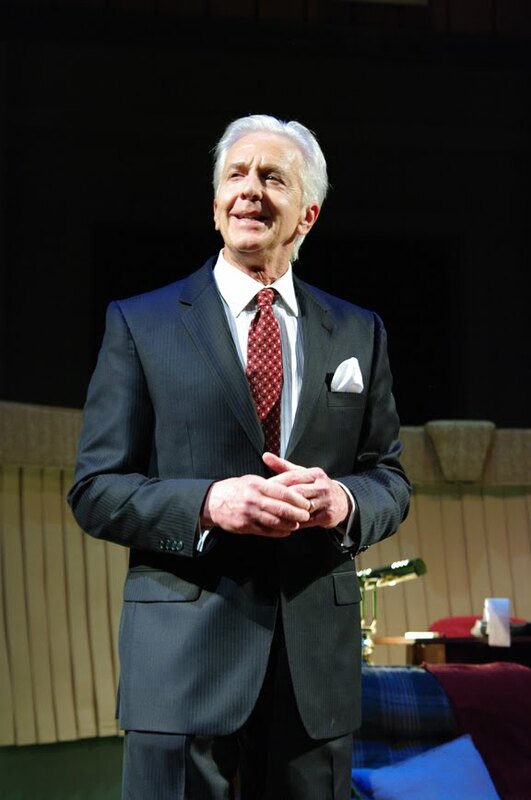 Personable and perky, McBroom connected easily and quickly with the audience with self-effacing tales as in I Want to be Round. Paying tribute to Indiana’s own legends with Hoagy Carmichael’s Baltimore Orioles, and Cole Porter’s I’ve Got You Under My Skin, endeared her to the audience as well. 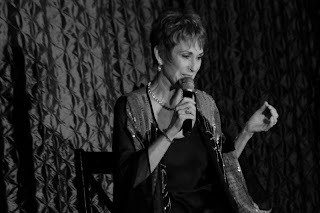 Accompanying the singer on piano, life and songwriting is Michele Brourman, who kept up with McBroom; not an easy task. The friends have created a balance whether performing, writing songs or laughing. The second act, consisting of Jacques Brel’s tragic-inspired poetic-style songs, proved to be the stronger act. The singer’s earlier light-heartedness was replaced with a sultry-smokiness as she recalled moments in time which gav e her life direction. 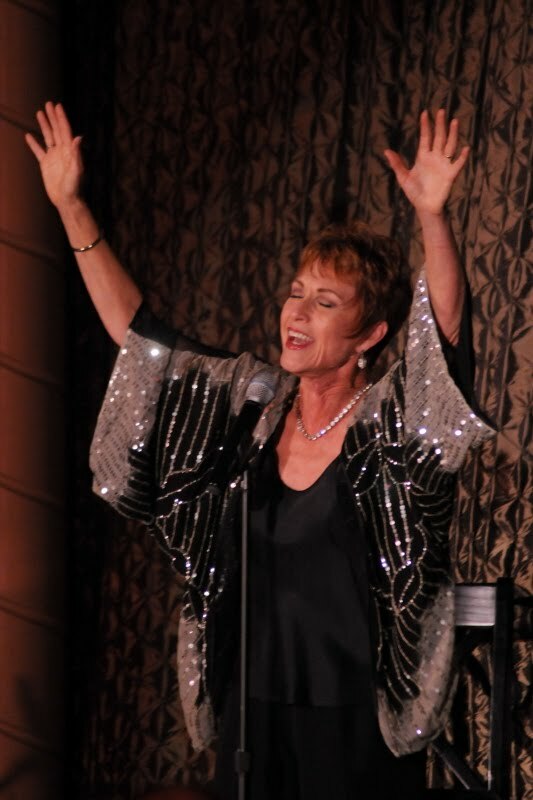 McBroom’s greatest talent is her ability to absorb into the song, channeling Brel’s emotions through her morphing into the lyrics’ style, creating a sensation so strong, it became uncomfortable at times. It was as if we were witnessing the actual heartbreaking moment when Brel’s life hit another sour note, inking the poison out of his system in an attempt to be free of his heart’s prison. Ending the evening with her made-famous-by-Bette-Midler tune The Rose, McBroom received a well-deserved standing ovation. Returning for an encore, she ended the night on a hopeful, whimsical note with When You Wish Upon a Star. Bottom Line: McBroom allows you into her world while retaining a mysteriousness, captivating the audience. If you have an performance or event you would like reviewed, e-mail elizabeth@gottago.us. The flutes are empty, the dresses rumpled and the after-parties have begun. I shall list the top seven categories and its winner. This just wasn't the year for large blue people to win little golden men, I suppose. I am pleased at how many (every single one) of the seven categories ended exactly how I wanted them to end. It's so lovely when that happens. Next time, I should probably put a little wager on it. Is that legal? This post is exclusively written for Gottago.us. Queen Latifah in a one-strapped pink and silver gown looked relaxed and stunning, as usual. Sandra Bullock, expected winner of Best Actrees category, arrived in her usual perky mood, and an elegant golden gown (a nod to her almost-certain win?) with her hair swept to one side. Best tux of the evening so far, goes to Robert Downey, Jr., wearing a bowtie in blue to match his lady's dress. Worst dress seen thus far goes to Molly Ringwald. Zoe Saldana did not choose well for this event, wearing a purple boa attached to a severe bodice. I am not entirely sure it was not a creation by a friend whose feelings she did not want to hurt. Best gown thus far goes to the blush pink dress worn by Anna Kendrick (Up in the Air). Brownie points to Jeremy Renner (Best Actor-The Hurt Locker) for bringing his mother as his date. This post is exclusive for Gottago.us. The pink bubbly is open once again, or still, and the Red Carpet Event is under way. Mariah Carey's golden globes are showing up and out in her navy blue dress, complete with a slit, because she does enjoy showing, well, herself. This year's look seems to be headed where I expected, strapless and elegant. No one has shown up looking as if they rummaged a yard sale before arriving, and blue and pink seems to be the colors this evening. This post is exlcusive for Gottago.us. 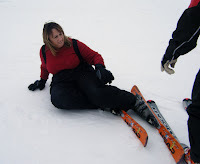 Always ready for something new, I accepted an offer to try downhill skiing at Paoli Peaks. Since it would take care of No. 2 on my Gotta Go Do list for 2010 (try a new sport), I packed up some hot chocolate and drove south. Situated approximately two hours from Indy, the ski resort was easy to locate and quite busy, breaking attendance records this season. Snowboarding, skiing, snowtubing and hanging out by the gigantic fireplace in the lodge are popular, it seems. I was left in the capable hands of Mark Jones. Being the ski school director makes him the Top Gun of skiers, right? For fellow first-timers, I’ve got a few tips. First, don’t put your skis on while standing backward on the bunny slope. The gentle slope is just that…a slope. Heading backward on a hill is not a great beginning. On the plus side, you do learn the art of falling right away. Next, when you lean forward like the Olympic skiers do, don’t plant your poles hard into the ground in front of you. It causes a harsh stop; trust me. And last, never, ever direct your skis toward your very nice instructor before you’ve learned how to properly stop. See where I’m going with this? Slamming into him is not great for a new friendship. He ends up on the ground, which is bad for one very good reason. Who is going to help you up if he is next to you in the snow? After getting hauled back up on my thin, waxed slivers, I peeked over and he was still smiling. Oh wait; that was a grimace. Why do you think he was shaking his head? The chair lift seemed safe, so I agreed. Then Ski Boy told me that I would hav e to finish going to the bottom of the very long slope to get on the safe looking lift to get back to the top of the mountain. All the way to the bottom? Remember, when you get on the chair to go up, you eventually have to get off. It’s not like a carousel where you can just keeping go round and round. Nope, you’ve got one chance and you’d better land correctly, or guess what? That’s right, the head-shaking and getting hauled up to your feet again. The sky looked pretty good from where I was laying, but I had to get vertical again. I opted to leave the outdoors to grab some dinner at 33 Brick Street, a local sports pub and display haven for all things Larry Bird: trophies, jerseys, including his No. 33, and signed basketballs. Their signature appetizer is Philly Chips. Handmade potato chips topped with all the goodies off a Philly sandwich is a great way to finish a day of skiing. You work up an appetite falling down all day. Arriving at my deluxe cabin at Patoka 4 Seasons, I decided to slip into something a little more comfortable. A Jacuzzi. Hey, snow bunnies need pampering. The wood-burning fireplace made the cabin even cozier, even though it was roomy enough for eight people. The Spa at French Lick proved simple to locate on the town’s main street the next morning. The beautiful resort also has a casino, but my mind was on my aromatherapy massage. The spa offers a variety of services, including hair, nails, massages and baths, tempting me to stay all day. Aah, maybe next time. The masseuse worked his magic on my muscles, and, revitalized, my thoughts turned to lunch. bigio, Italian country bread. Nick Doty, winemaker, took me on a private tour of the family-run facilities, recently expanded due to high demand for their affordable wine s. Tasting-room guru Adrian shared wine samples. My favorite white was Traminette, which Doty feels could take top awards at this year’s competitions. My last stop was Big Splash Adventure hotel and indoor water playground. The immense size of the water park makes it a destination hotel. With bunk beds in the rooms and a tropical paradise down the hall, it’s easy to understand why this would be a kid’s dream come true. Driving home, I contemplated where I should venture next. Hmm, snow melts when warm weather comes, making it into water and…oh yeah, water-skiing. Maybe the lake won’t be as hard as a mountain when I fall. If you have a travel location or event you would like reviewed, e-mail elizabeth @gottago.us. Me, I’ll be right here, looking for my swimsuit and flippers. This post was originally published under "Gotta Go!" in the West Side Community News in Indianapolis, and the West Indianapolis Community News.